Come for regular off-peak sessions of counselling and psychotherapy, and when you purchase your initial block of 6 sessions, get one extra session FREE! Your therapy sessions will help you calm down your eating behaviour so you feel more in control, and support you in understanding some of the themes that are maintaining your struggle with weight, and show you how to work through them. We can help you with binge eating, depression, bulimia, anxiety and all other psychological issues that are affecting your eating. Simply complete the form below, and we will contact you to arrange an initial 15-minute assessment so we can fully understand the struggle you are facing, and the type of support you are looking for. We can then get you booked in to meet one of the therapy team for a Free 30 Minute Session. 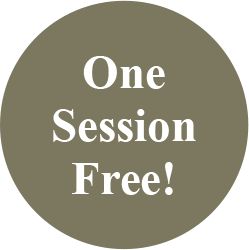 You can also make a Live Booking for a Free 30 Minute Session, by clicking the button below. We have availability Monday to Friday with a block of 6 off-peak sessions ranging from £330 to £420 so you benefit from great rates, relaxed daytime appointments and one extra session as well. Places are limited and will be allocated on a first come first served basis. We look forward to hearing from you.